The year of 2015 was filled with good times. My journey to Europe was great and I enjoyed it a lot. There were some good planning involved but I really didn’t spend a ton of time on it. I traveled with my sister so it was awesome. We spent four full days in Paris. Upon arriving, we purchased a SIM card for one of our phones so we can navigate the city. We utilized Uber and the metro as our mode of transportation but we walked a lot. For lodging, we opted for Airbnb and we were very lucky to secure a very Parisienne apartment right off of Avenue de l’Opéra near Place Vendôme and steps from the Louvre. Once we made it into the apartment, we engrossed ourselves in the beauty of the space and expressed gratitude for safely arriving Paris. A short while later, we strolled down the street to Epicerie Ace-Opéra and we purchased eggs, butter, water, cheese, more wine and quiche. Then we walked further to a boulangerie and loaded up on croissant (lol). Our host, Sophie, was so lovely, she left us a tall bottle of water, orange juice and white wine with a sweet note. Much appreciated gift! Here’s a quick view of the apartment. It was lovely and I would book this again in a heart beat. The first sight we explored was the Louvre since it was down the street. This musée is so gigantic, I can’t imagine anyone have actually seen all of the exhibits; however, I am certain someone has attempted it. This musée holds a plethora of artwork that are completely worth the trip to Paris to see. I read an article that stated in 2015, over 8.5M people (75% foreigners) strolled through the halls of the Louvre to peek at the famous artwork of legends; I was one of those people. 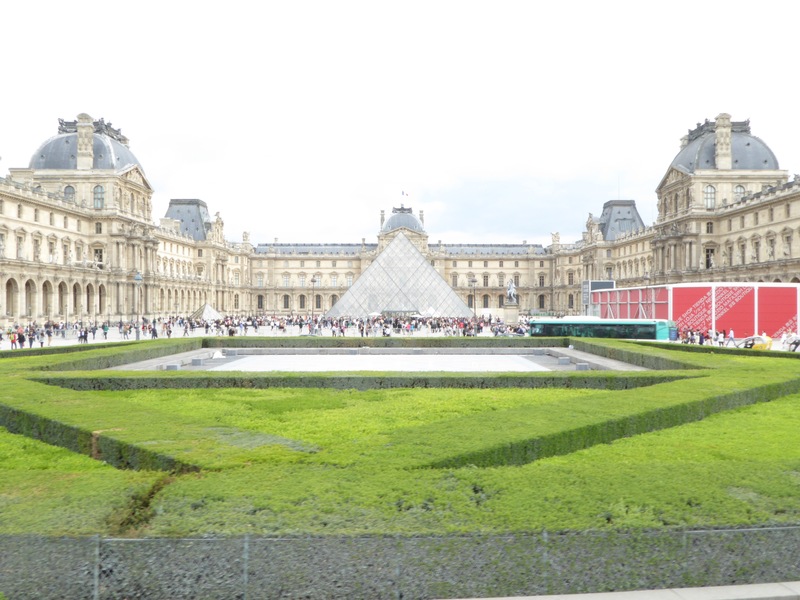 Americans and Chinese made up the largest nationality group of foreigners to visit the Louvre. As any tourist, I purchased a city pass because it made financial sense; therefore I recommend it. The pass offers many great options, I used it to visit the Louvre, Musée d’Orsay, Arc de Triomphe, Seine River Cruise, Eiffel Tower (that I missed due to stupidity and oblivion), Hop-on/Hop-off bus tour and whatever else I’m forgetting. Oh, I had an option to visit Versailles, but didn’t have time because it’s a commute. So on our last night in Paris as we strolled to the best dinner ever, my sister and I discovered more gems of the voisinage. We were walking to this amazing restaurant, l’Ardoise, for dinner and realized the original House of Chanel was steps from the Airbnb apartment. It was a wonderful surprise! Side story: on our first night in Paris, my sister and I dined at small Italian restaurant around the corner from the Airbnb apartment and we met two lovely ladies (fellow Americans) who thought we were French (loved that we assimilated so well). Tables are set so close, it’s like we were a party of four. We engaged the ladies and exchanged information. A few days later, one texted us recommending l’Ardoise for dinner; that’s how we ended up at that amazing restaurant. The service was impeccable and the food was a dream. I still reminisce of the food. Paris was amazing. I enjoyed the most exquisite French cuisine someone in my tax bracket could afford, I enjoyed fresh pastries and croissants to my heart’s content, and overloaded myself with fromage, thé and Macaron. It was great! I cannot wait to visit France again. Now, on to have thé with the Queen via the Eurostar. Part II coming soon.